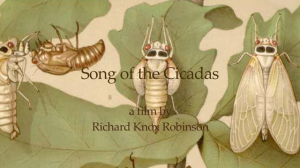 Documentary filmmaker Richard Robinson speaks with Sean McCord on his film Song of the Cicadas. Based on an idea from David Rothenberg’s Bug Music, Song of the Cicadas explores the metaphors evoked in comparing the incarceration of American Political Prisoner Timothy Blunk (Resistance Conspiracy Case) with the 17 year period spent underground of the Magicicada. Filmed in an historic prison during a Cicada emergence, Song of the Cicadas forms a poetic critique on the politics of incarceration and the surveillance aspects of media.